Using “UV” light to disinfect water, an effective method in destroying micro-organisms in a water stream, is an endorsed technology by the EPA and is currently being used by a wide range of manufacturers and industries. Ultraviolet water disinfection is beneficial because it does not use chemicals to purify the water thus avoids the potential of creating harmful chemical by-products and will not alter the odor or color of the water. Ultraviolet systems use special bulbs that emit UV light of a particular wavelength that attacks the microorganism and stops the microorganism's ability to function and reproduce. 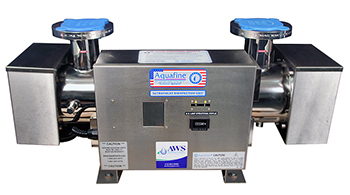 All Water Systems has over 30 plus years of experience providing water treatment solutions for a wide range of industries and applications including ultraviolet water disinfection. We take the time to fully understand your water usage, quality requirements, and applications to help select the proper equipment for you. We can help you select the quality of the UV light and of the contact critical to effective disinfection. We choose the correct size and components based upon the application and level of disinfection required. Since ultraviolet systems do not destroy solids, it is important to select a good pre-filter to remove any dirt or debris that may be present in the raw water supply which may interfere with the effectiveness of the UV rays. For More Information about ultraviolet water disinfection systems, call (412) 824-6560, or click here to contact us.